A common and widespread species which is easily recognised by the unique appearance of the inflorescence which fancifully resembles several fleas attached to the stem. The fruits are shiny and dark brown, unlike the pale fruits of the otherwise similar and much rarer few-flowered sedge (Carex pauciflora). 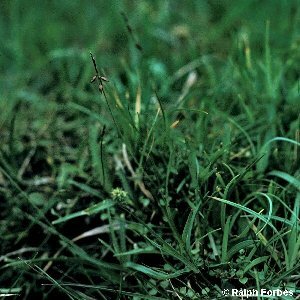 Flea sedge is found in wet ground such as in fens, wet dune-slacks, wet heaths; especially common in upland areas. All names: Carex pulicaris L.